El Farolito Soccer Club, in the yellow kits, notched a 2-0 victory over Sonoma County Sol FC on Saturday to advance in the playoffs. Photo by Abraham Rodriguez. In a do-or-die playoff match, El Farolito Soccer Club will live another day after defeating Sonoma County Sol FC Saturday in the opening match of the lengthy National Premier Soccer League playoffs. 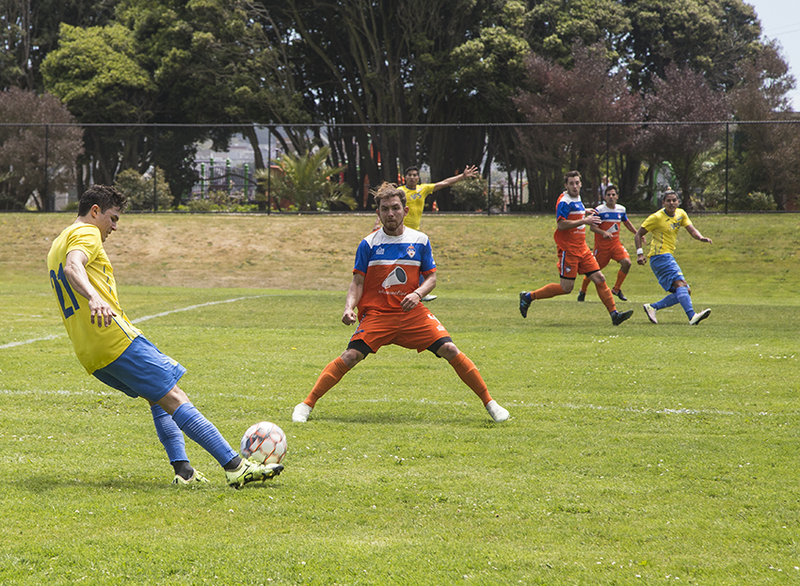 The San Francisco-based soccer (and burrito) dynasty managed to score two goals on its NorCal opponents, and kept the game moving — even while down a man in the last half of the game. The match kicked off at noon and was held at the Eisenhower-era Boxer Stadium in Balboa Park, next to the BART tracks; train noises occasionally overpowered the incessant yelling of the teams’ head coaches. El Farolito this year jumped from the local semipro San Francisco Soccer Football League to the NPSL — an actual rung on the ladder of American professional soccer, three slots below Major League Soccer. In its first year at a higher level, the restaurant- and bar-affiliated club excelled, winning nine games and drawing five in the regular season. But for the first 20 minutes of Saturday’s contest, the outcome was in doubt. Both teams were at each other’s throats; El Farolito couldn’t land a cross, and Sonoma, to its credit, maintained its backline and pestered El Farolito in the midfield. The home side broke through in the 37th minute, when a shot from Arnhold Rivas hit the crossbar and ricocheted down into the goal. The score was contested by Sonoma, but ultimately given by the officials. This was the sole tally in the first half. The second half proved to be even scrappier. A number of fouls, hard hits and scuffles between the two teams culminated with a red card issued to El Farolito’s Ademar Rodriguez around 17 minutes in. Down a man for the remainder of the second half, El Farolito not only maintained its lead over Sonoma with just 10 players, but added a short-handed goal from Camilo Campos. El Farolito’s head coach and general manager Santiago Lopez said winning the club’s first playoff game was great, but came at a heavy price. Between Rodriguez’s mandatory suspension for the red card, and injuries incurred today, Lopez figures to be at least two starters down for the next match. But all the team can do is adapt and study film, he said. The El Farolito team was founded in 1985 and won nine championships on the city level; its impressive array of trophies is displayed at the Farolito Bar at 24th and Mission. The next playoff contest has yet to be scheduled, but will likely be next weekend.